Today I am remembering the Blanton Museum of Art, at the University of Texas in Austin. As you have probably heard, everything is bigger in Texas, and the Blanton Museum is a fine example of that. It is one of the largest university art museums in the United States and it has the largest and most comprehensive collection of art in central Texas. It is as impressive as it sounds. While I was visiting I saw a temporary exhibit: Through the Eyes of Texas: Masterworks from Alumni Collections. The exhibit featured over 200 diverse artworks- ancient, modern, and contemporary all intermingled. The mix of time periods, techniques, and subjects could have been awkward, but the show was expertly curated, and each piece felt as though it belonged. 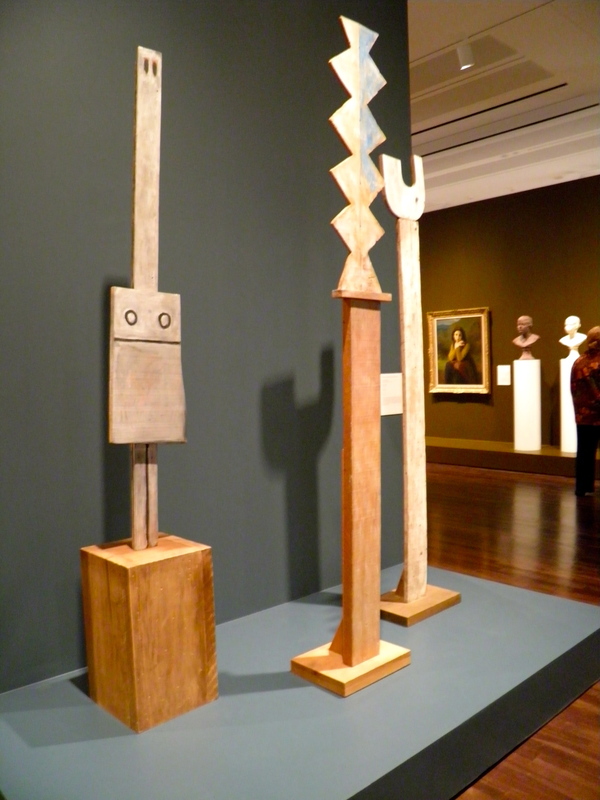 These were privately owned pieces, so it was a treat to see them in a museum setting. The permanent collection was striking and inspiring. The lighting and the layout of the museum was incredibly thoughtful. Because the museum is so large the artworks have room to breath. The ceilings were tall and the walls were wide. The paintings felt appreciated and special simply because of the careful placement and lighting. The sculptures did not shrink in the large space but were easily accessible from all angles. It is rare for me to love the building and the museum itself, just as much, if not more, than the art. One thing that made this museum experience even better is that it was free. The museum is free for all on Thursdays. Another plus is that photography is allowed- so check out these great pics! My visit to the Blanton Museum was one of the highlights of my trip to Austin! For Father's Day this year my family went for a hike in Dogtown Park in Gloucester. The park is 3600 acres of woodsy trails and abandoned roads that used to be the Commons Settlement, a prosperous part of Gloucester in 1642. There are no signs of old houses, inhabitants, or daily life, but there are over 20 Babson Boulders scattered throughout the park with carved inscriptions. Millionaire philanthropist Roger W. Babson hired immigrant stone cutters to inscribe the boulders in Dogtown with words of inspiration during the Great Depression. We felt like we were on a scavenger hunt looking for these marked boulders. The words on the rocks are timeless values and advice- very fitting for Father's Day. Babson said, "I am really trying to write a simple book with words carved in stone instead of printed paper." Carved rocks give the words and phrases such a sense of permanency and stability. The natural setting makes the typography even more poetic. We really enjoyed our day at Dogtown, and got some awesome photos! I wanted to go to Austin since sixth grade. In sixth grade I watched the movie True Stories and dreamed of visiting Texas to see David Byrne in a cowboy hat, a parade of accordion players, gospel singers, wide open roads, and the "color of white paper". I wanted to celebrate the "special-ness" of Austin. I wanted to see why Austin was so weird. True Stories became my favorite movie and I wanted to go to Austin more than anywhere else. It is inspiring to be in a city that is filled with creative minds. The young musicians and artists are the essence of cool in their cowboy boots and vintage dresses. The foodies and entrepreneurs are trendy with their beards and fedoras. The coolness is approachable, warm, and humble. The vibe is confident but casual. The air is warm, so everyone is out, and everyone is a potential friend. 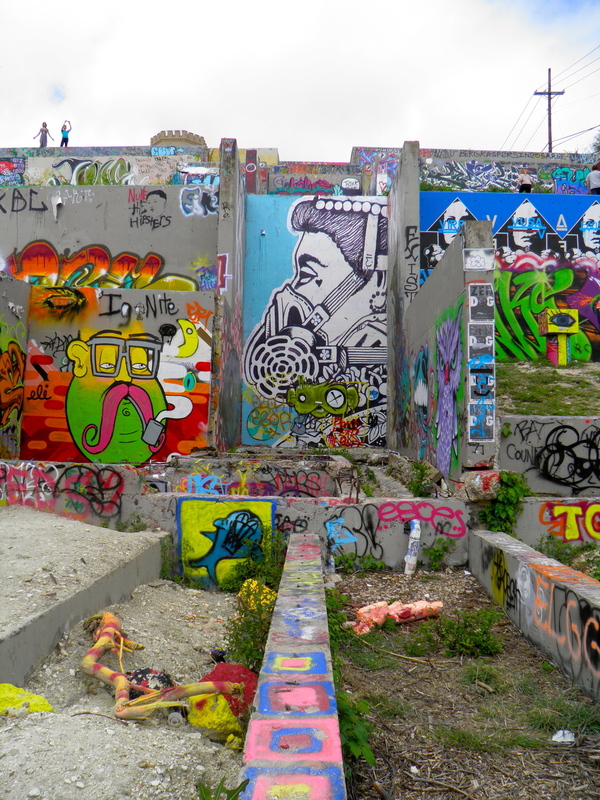 Art is ingrained in the city of Austin. The streets are marked with hand painted signs, chalk drawings, graffiti, graphic architecture, and murals. Every detail of the city oozes with good artistic taste- the stainless steel chairs, the wrap around porches, the dog with a red bandana, the unidentified cactus, the neon signs, the wide sidewalks, and the scent of tacos. I felt inspired by the unexpected artistic moments. In Austin I soaked up every moment, every detail, every font, tree, traffic light, sculpture, and song. Austin has inspired me to open my eyes wider to the art, design, and people all around me, no matter where I may be. "I really enjoy forgetting. When I first come to a place, I notice all the little details. I notice the way the sky looks. The color of white paper. The way people walk. Doorknobs. Everything. Then I get used to the place and I don't notice those things anymore. So only by forgetting can I see the place again as it really is."